Almost 11,000 demonstrators have attended a pro-Palestinian protest in the Austrian capital Sunday between the Hofburg Palace and the Rathaus town hall, in anger at Israel’s military campaign which has killed more than 400 people already. 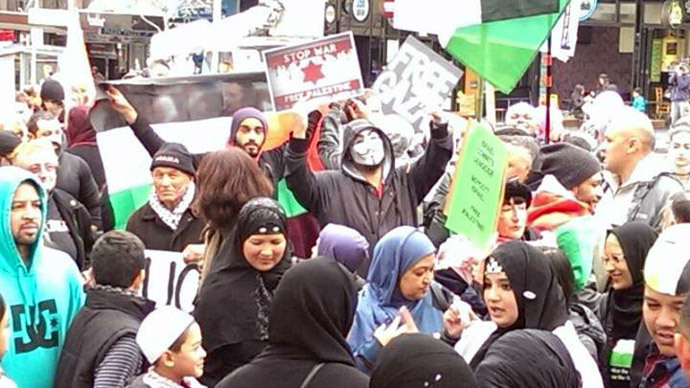 'Free, free, free Palestine' and 'Let Gaza Live', the protesters changed while wielding a variety of posters and flags. "We are not against the Jewish people. the Jewish people should feel free and live free like everybody. 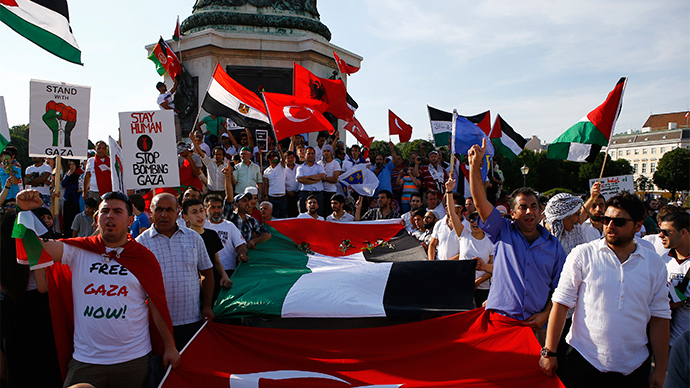 We are against the Zionists, actually, who are supported from this big, big mafia and lobby around the world," Abderrahmen Laarouchi told Ruplty. The protesters made their way to the historic Hofburg Palace, which is now the official residence of the country’s president. The demonstrators were playing drums and some were carrying bloody sheets wrapped like a dead body or dolls, signs saying "Made in Israel". "We should stand here - Austrian, English, Jewish, Muslim, Buddhist, all together - to stand for and stand up against the Zionist system all over the world. Free Palestine," Laarouchi said. 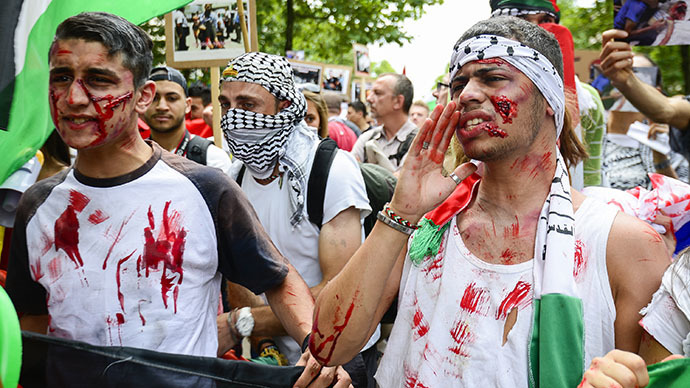 The Vienna protest comes on day after as nearly 15,000 people hit the streets of London and marched from the Israeli Embassy to Downing Street. 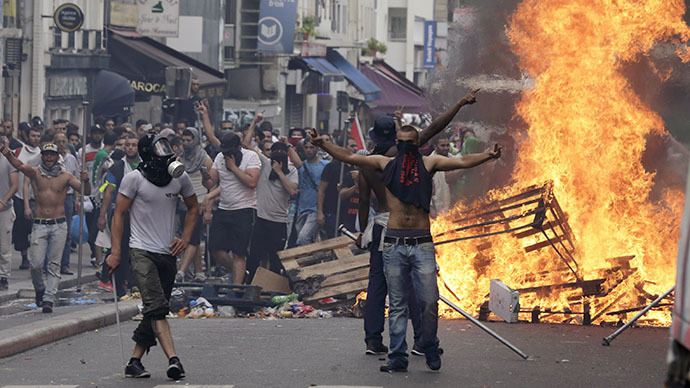 Same protests took place in Paris Saturday, but resulted in several injuries and at least 38 arrests. Dozens of protesters used stones and bottles to attack police lines for several hours in northern districts of the capital. At least 87 Palestinians and 13 Israeli soldiers were killed on Sunday, as the Israeli Defense Forces shelled the Shejaia district in the north east of Gaza. 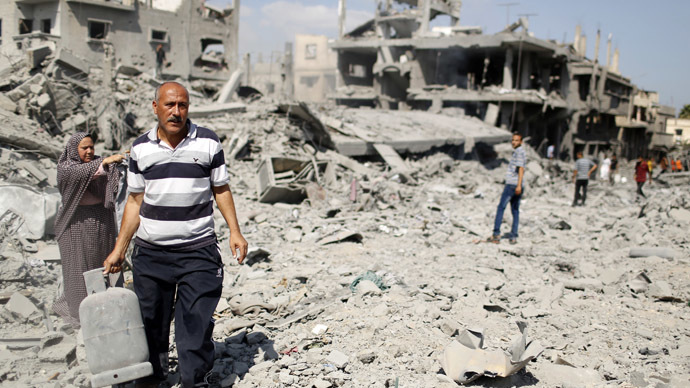 The casualties are the heaviest since Israel launched its offensive on the Palestinian territory on July 8.